Salvatore Ferragamo will launch Incanto Bliss, a new sparkling fruity floral fragrance for women, this coming January in Japan, March elsewhere in the world. Incanto Bliss is the latest flanker to 2003's Incanto perfume, and follows Incanto Dream, Incanto Charms, Incanto Shine and Incanto Heaven. 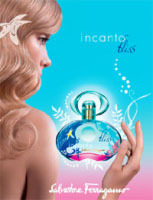 Incanto Bliss was developed by perfumer Beatrice Piquet, and the notes include yuzu, kumquat, apple, freesia, water lily, rose, musk and woods. I know this is wrong and judgemental of me, but the ad already has me put off of this fragrance. Is it meant to appeal to teenagers? At 31, I feel much too cranky to enjoy a scent that is represented by such nubile graphics. I was 16 when Incanto launched and it made me cranky, too. It's not just geared to teens, it condescends to them. Blergh. Apparently the memory makes me nauseous as well as cranky. How many Incantos does one need? Apparently never enough. I think even Ferragamo has thought that through — I'm pretty sure they discontinued one of the series when they released the one before Bliss. The notes sound very similar to D&G's light Blue. But you can see the benefits of being in the same category. ENOUGH INCANTO ALREADY!!!!! GOSH! The Original Incanto is actually Quite Marvellous, a Fresh, Fruity kinda Floriental… and was really the only one that should see the light of day! not that the Flankers have been offensiv, but have been… Innocuous! too many Variants on the same idea and nothing remotely orginal about a one of them! Heaven, Bliss, Shine, Charms, Dreams… Who Needs it really. As a Lark to purchase one and give it a twirl, fine, but this is beginning to seem like overkill! It’s at Sephora in the States already, if that helps!